It’s officially Autumn, so let the fall fun and games commence! Pumpkins, corn mazes, and hay rides await. Here are some of the fall festivals coming up in Austin and beyond. Many are free, but those that are not have the admission fees listed below. Join Barton Hill Farms for the 2014 Fall Festival and GO HORNS Maze! The farm is set amongst 100-year old cottonwood trees, rolling grass hills and the beautiful Colorado River. This Fall Festival is the perfect setting for all members of the family. Kids enjoy outdoor entertainment including rides, games, a corn maze, a pumpkin patch and farm animals; Mom and Dad enjoy live honky-tonk music while sipping a frosty brew on the banks of the Colorado…. You can even catch Longhorns football on the outdoor TV. Head to the most picturesque pumpkin patch in Central Texas. Activites for all ages range from kayaking to pony hops, a massive jumping pillow, steer roping, a life-size sunken pirate ship, and an early Texas fort, yard games and other outdoor activities. Take the 30-minute drive from downtown Austin to this year’s Fall Festival and GO HORNS Maze at Barton Hill Farms! Cost: Ages 3-10 General Admission, $8; Adventure Pass, $13. Ages 11+ General Admission, $11; Adventure Pass, $15. Save $1 when you purchase tickets online! The Hawaiian Falls Pfall Pfestival is every weekend from October 3, 2014 through November 2, 2014 at the newly opened Adventure Park and Aloha Event Center. Visitors from the local community and across the region will be entertained with a variety of games, craft stations, activities, live music, fall food favorites and more while strolling through the decorated grounds. Additional festival highlights include Family Fall Photo Opportunities, Daily Monster Mash Dance Party, Bounce Houses, Do It Yourself Take-Home Craft Stations, Family Adventure Trail Spooky Maze of Fun, and Trunk or Treat on Halloween. Hours: Fall Festival Hours – Friday 4-9:00 p.m.; Saturday 10:00 a.m. – 5:00 p.m.; Sunday 11:00 a.m. – 5:00 p.m. Cost: Entrance to the festival is FREE. Tickets may be purchased for activities and crafts. Pumpkins are cash or card and vary from $5 to $25 depending on size of pumpkin. Pumpkin painting on-site for a nominal fee. You may provide your own pumpkin. Adventure Park will be open during festival hours. Guests may purchase an All-Adventure Park Admission for $29.99 which also includes 10 festival tickets. Attractions may also be purchased on an individual attraction basis with cash or tickets. Coupon Offer: Receive 2 free tickets for every 10 tickets purchased using this coupon. Hours: Saturdays, 10:00 a.m. – 5:00 p.m. and Sundays, 1-5:00 p.m. Harvest the fall fun at Sweet Berry Farm with corn mazes, Berry Bouncers, pumpkin painting, stuff your own scarecrow, hay rides, train rides, ice cream, and lots more. Hours: Monday – Saturday (excluding Wednesday) from 8:30 a.m. – 5:30 p.m.; Sundays from 1-5:00 p.m. Hours: Monday – Thursday from 10:00 a.m. – 2:00 p.m.; Friday and Saturday from 10:00 a.m. – 5:30 p.m.; Sunday from 12-5:30 p.m. Cost: October Fall Fun – $6 for everyone age 2 and up. Foster children get in FREE with legal paperwork. Active military get in FREE with valid ID. If you bring an October church bulletin, you can get a FREE mini pumpkin to paint. Join Hancock Recreation Center for this FREE, family-friendly event featuring: carnival games, face painting, bounce house, music, and prizes. Hayrides, carnival, Trick-or-Treat Village, costume contest, and a FREE showing of ParaNorman (PG) at 6:45 p.m.
Support Blanton Elementary School while enjoying fun the whole family: a haunted house, inflatables, hay ride, a toddler area, and over a dozen carnival booths. Join Bannockburn Christian Academy for a lovely fall evening with your children. There’s something for everyone–bouncy houses, a train, face painting, food, and loads of games to play. Join Northwest Recreation Center for their annual Halloween Trick or Treat Path and Carnival. All ages welcome! Cost: FREE to enter. First 10 tickets are FREE; additional tickets can be purchased for $0.25 each. Celebrating Fall with games, bounce houses, student performances, food, and prizes. Hours: 11:00 a.m. – 4:00 p.m.
Crowes Nest Farm will host its annual fundraiser. Hayrides, raptor and snake shows, cow milking, and more, plus plenty of homemade treats and craft items! See the event flyer. You won’t want to miss this amazing fall festival complete with inflatables, live music, food trailers, and plenty of games and activities for the whole family. Celebrating science and technology education at Davis, DolphinFest is a fun, simple and engaging way for the whole community to make Davis Elementary the best school in Austin! Stop by the Golden Age Home Assisted Living pumpkin patch for a fall carnival. Proceeds from pumpkin sales benefit the Activity Department for the residents. Come on out to the First Baptist Church of Oak Hill for Family Fun Day. Enjoy FREE family portraits, FREE hayrides, food, a Chili Cook Off and a Cake Bake Off. There will also be a cupcake walk, a bake sale, face painting, crafts, a raffle, games, and a hot dog contest (enter the contest for $3). Everything at the event is strictly run by donations. All families are welcome. All proceeds from this family-friendly festival benefit programs at Summitt Elementary. Families can enjoy carnival games, a jumpy house, concessions, and a petting zoo. There will be games and prizes from 2-4 p.m. followed by a costume contest from 4-4:30 p.m. Everything is free of charge (including hot dogs). At Family Fest 2014 you will find such activities as: dunking booth, petting zoo, go karts, obstacle course, sports activities, all kinds of preschool booths, face painting, concessions and more. There will be prize and candy giveaways. Food will be available for minimal cost. All ages welcome. Enjoy carnival games with prizes and candy while The Nut Job plays on the big screen. Don’t miss the costume contest. A haunted hayride, barrel train ride and concessions will be available for a nominal fee. This fundraiser for Gullett Elementary features over 25 activities and games for kids of all ages, lots of great food, and…a very, scary Haunted House – scarier than ever! Join Titan Moon’s Halloween celebration and pick up free comics. Activities will include a costume contest. There will also be a silent auction for a variety of pumpkins decorated by local artists. All proceeds from the silent auction will be donated to a local charity. Elgin goes hog wild for this FREE family festival. It is a time for family friendly fun and casual feasting in the Sausage Capital of Texas with all the pink pork trimmings this proud central Texas town can root up. The festival features live music on three stages this year, handmade arts and crafts, children’s activities, a children’s costume pet parade, a carnival, Road Hog Car Show, BBQ Pork Cook-Off, In a Pig’s Eye Dart Contest, the crowning of King Hog or Queen Sowpreme, Hogalicious Dessert Contest, Cow Patty Bingo, the Pearls Before Swine Art Show and great festive food! Location: Free Festival Shuttle available at the Hwy 95 North Park and Ride. Come join Leander Fire Department (LFD) at their Annual Fall Fun Festival. LFD has carnival style games, vendors, food, haunted house, silent auction and more at this family event. All proceeds go to the Leander Volunteer Fire Department. Cost: FREE to enter festival. Tickets for games start at just 50¢ and touring the Firehouse of Horror is $5. Bring your family, friends and neighbors for a day of fun at the pumpkin patch. The Festival will include family fun, a hay ride, children’s games, a moon jump, food, a cakewalk, crafts, prizes, clowns, music and more! The carnival, which will feature a costume contest at 5:00 p.m., a wide variety of games, food/beverages, live bands, and other fun-filled activities including the very popular (and scary!) haunted house. The Austin High School Orchestra and its feeder middle school and sixth grade elementary school orchestra programs will perform 3:30-7:30 p.m. Looking for an afternoon of fun fall activities? Do you love shopping for local and handmade arts and crafts? Our Savior Lutheran Fall Festival & Bazaar is the perfect place! The Bazaar will have crafts, jewelry, and handmade goodies – perfect for early Christmas shopping. The Bazaar is from noon – 5 p.m. Looking for activities for the kids? The festival is full of fun activities including bounce houses, velcro wall, inflatable slide, train, toy raffle, ring toss, and much much more. The festival is from 2-5 p.m.
Northwest YMCA’s safe and family-friendly Halloween Spooktacular event will feature: haunted candy trail, spooky family games, face painting, pumpkin patch, zombie cupcake walk, mad scientist lab, arts & crafts, raffles & prizes, and Take 10 Compression Training presented by Seton Hospital. This Spooktastic festival is open to all ages; activities are targeted at children 2 to 12 years old. Join the fun and games: costume contest, color your own trick-or-treat bag, candy scavenger hunt, spooky storytelling, Halloween craft table, carnival games, pumpkin decorating, inflatables, face painting, scary snacks station, trackless train rides, space ball, and more. Hours: Noon – 2:00 p.m. Calling all hearing and Deaf ghouls, goblins and ghosts! Creep and crawl your way through Texas School for the Deaf Foundation’s third annual Spooky Skedaddle 5K timed run, 1K Fun Run & Halloween Festival. Come in costume and enjoy an afternoon full of races, music, food trucks, trick-or-treating and festival games. Cost: FREE to enter festival. $1 per ticket for the games. $3 to run in the 1K Halloween Costume Fun Run. $30 for timed 5K Race (includes a T-shirt). Food, bouncehouses, pony rides, petting zoo, rock wall, games, and trunk or treat. Children can come and collect candy at decorated cars, play carnival games, bounce in jumpy houses, pet cute animals, enjoy a hayride, and eat yummy treats. The event will be fun for the whole family with a concert by Remedy Drive at 6:30 p.m.
An incredible afternoon of great Fall fun in South Austin. Enjoy food, carnival games, face painting, hay rides, and cotton candy. Play in bounce houses and fly sky high on a Eurobungy. All this and so much more for the whole family. Come one, come all to a fun, safe, family friendly festival at Shepherd of the Hills Christian Church (Disciples of Christ). There will be food, fellowship, games, candy, and lots of great costumes. Everyone is welcome. Come out and support St. Peter’s Lutheran Church as well as other churches and community organizations. Festival will feature: live music, live auction, raffle prizes, kids activities, pony rides, inflatables, haunted house, costume contest, and more. Everyone is welcome. Join this Pfamily Pfriendly celebration of the Fall season. Harvest Festival will include: outdoor and indoor games, crafts, free food, maze, door prizes, live music, and a silent auction. Costumes are welcome but nothing scary, please. Free event for the public featuring: trunk-or-treat, petting zoo, bouncehouse, games, train ride, crafts, food, and more. All ages welcome. There will be a bounce house, face painting, games, prizes, music. Plus, FREE hot dogs, snow cones, popcorn, Frito pies, and cotton candy. Location: Trinity Abundant Life Church, 412 Cumberland Rd, Austin. Cost: FREE but guests are asked to please bring a canned food donation to help supply the church’s food pantry. This year’s theme is Pirates! Take a voyage to the park for a fun morning filled with pirate-worthy adventures and games. Jump on a hayride, conquer a game, earn treasure, treats and eats! Sail through a new book and come take a look. Entertainment and fun for everyone! Be sure to wear your favorite costume! There will be carnival games for toddlers and preschoolers, hayrides, cookies and punch and fun entertainment for all to enjoy. Enjoy a FREE family-friendly Fall Festival with a petting zoo, laser tag, carnival games, a video game trailer, a cake walk, a hay ride, a family photo booth and FREE food! There will be hot dogs, nachos, popcorn, cotton candy, and lemonade. Call 512-258-6909 for more information. Wurstfest is a 10-day salute to sausage. See the schedule here. Admission is FREE on opening day, November 7, until 7 p.m. Cost: FREE on opening day, November 7, until 7 p.m., and on closing day, November 16, after 3 p.m. Children 12 and under are always admitted FREE. Adults are $8. Get a buy one, get one free coupon here. Bring the kids for games, prizes, treats and, much more. This event is guaranteed to be fun for the whole family and all are welcome. Support Ridgetop Elementary while enjoying rides, games, prizes, food, entertainment, and family fun. Hours: Noon – 9:00 p.m. The festival will include games, petting zoo, bounce houses, craft show, cake walk, free food, and prizes. 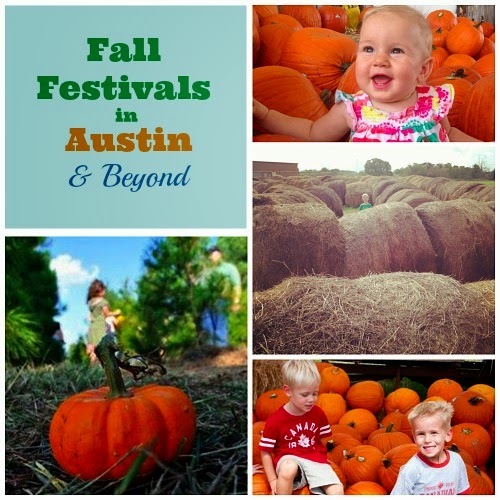 For more fall fun, be sure to check out our guides to Halloween Events and Austin Area Pumpkin Patches!